A devastating knock from captain AB de Villiers coupled with contributions from the rest of the top order saw South Africa post their highest ever ICC Cricket World Cup total as they posted 409/5 after batting first against the West Indies at the Sydney Cricket Ground on Friday. 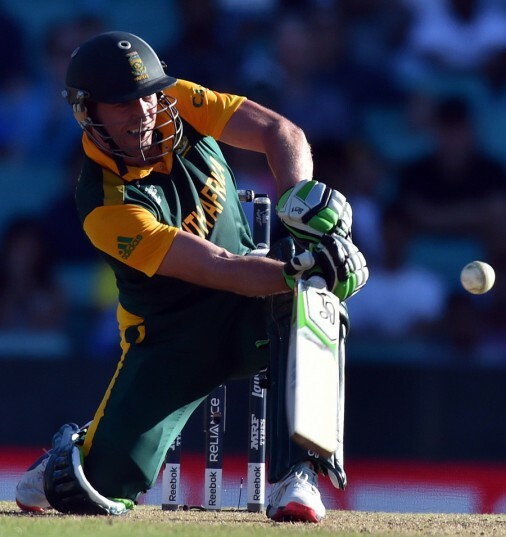 De Villiers added the second fastest World Cup century, and then the fastest ever 150, en route to his eventual 162 off 62 balls to help the Proteas post the highest ever One Day International total on Australian soil. The West Indies bowlers could find no foil for the skipper as he pelted the ball into several quarters of the SCG but it was the solid platform laid before De Villiers walked to the wicket that led to the eventual carnage. Hashim Amla and Faf du Plessis both scored half-centuries in a stand of 127 runs for the second wicket although there was a collective baiting of breaths as the two departed within three balls with Chris Gayle providing the breakthrough in the 30th over. But De Villiers and Rilee Rossouw, brought into the side to replace the injured JP Duminy, settled quickly at the crease and upped the scoring rate towards the back end of South Africa’s innings. In the last 20 overs 261 runs were added, 150 of those coming in the last 10 overs, and Rossouw’s knock of 61 off 39 balls would also prove valuable. David Miller managed 20 runs off 22 balls but he fell to the bowling of Andre Russell – with Jerome Taylor taking a brilliant one-handed catch at long-on – in the 47th over. But destructive De Villiers powered on to the end of the innings, ending it with consecutive sixes to help South Africa to their total.